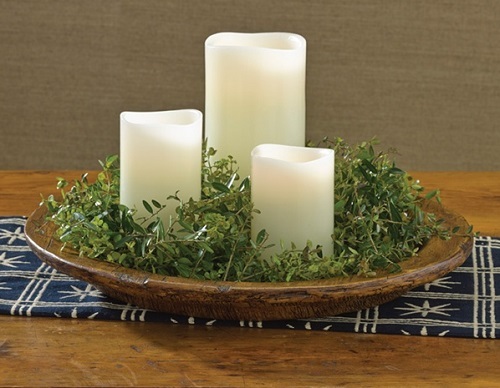 Wares made of treen (Middle English for wooden) were used for cooking and serving food in colonial America before pottery was readily available. With its modest designs, lustrous patinas and historical significance, treenware from this period is highly prized by collectors. Great care has been taken to craft fine reproductions of these wooden collectibles. Made from a resin base, each piece is hand-finished to give it the rich, time-worn patina of an early American antique. No two pieces are exactly the same. Variations in color and patina ensure that each piece has its own unique character and beauty. 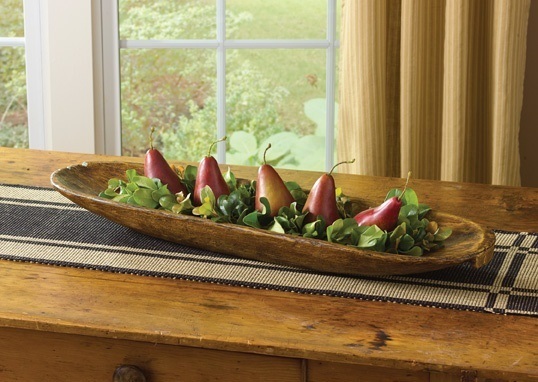 Just as you would not use antique woodenware for serving food, these reproductions are for decorative purposes only. Not for unwrapped food. Reproduction Treenware - "Grain Scoop"
Reproduction Treenware - "Powell Round Tray"